Mufasa, one of the two beehives that Bee Daddy and I have fretted and fussed over, has died, or if not dead, is mostly on her way out. Unlike her namesake, she wasn’t pushed off a steep edge by a rival, but sadly succumbed to an all too common infestation of honeybees: varroa mites. That’s what we think, anyhow. In December, long after our last hive check of the year before the days grew chilly, I was out and about in the back garden. I noticed some bees crawling along an open space in the garden a little ways in front of where Scar and Mufasa are situated. Then I realized that it was more than just a few bees–indeed, there were hundreds of bees crawling along the ground. I observed this massive and confused exit from the hive for several days, reading what I could about what I was observing. 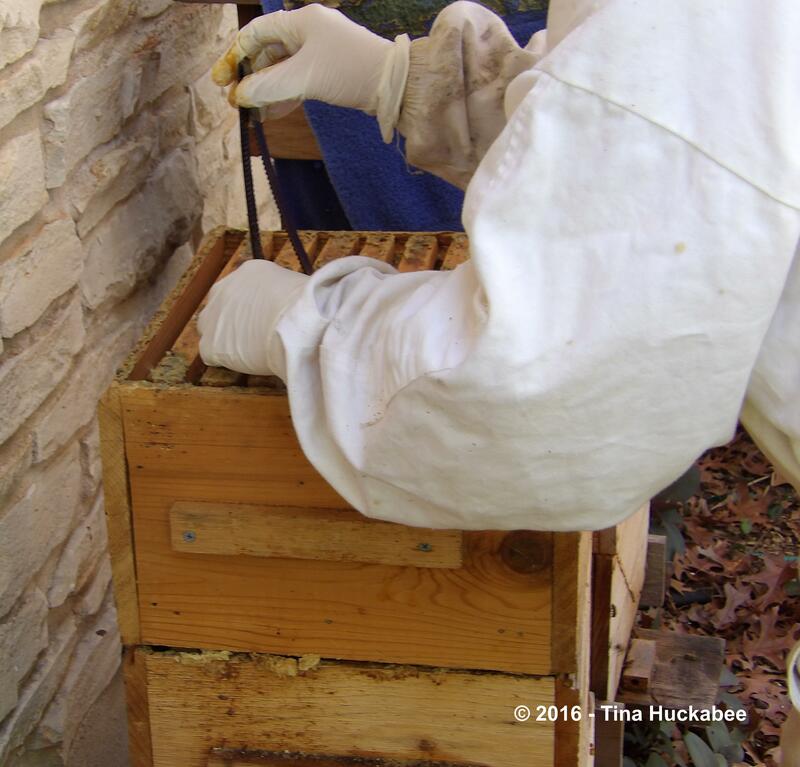 I contacted a leader of the Austin Area Beekeepers Association and he confirmed what I suspected: my honeys were abandoning the hive because of sickness from a varroa mite infestation. 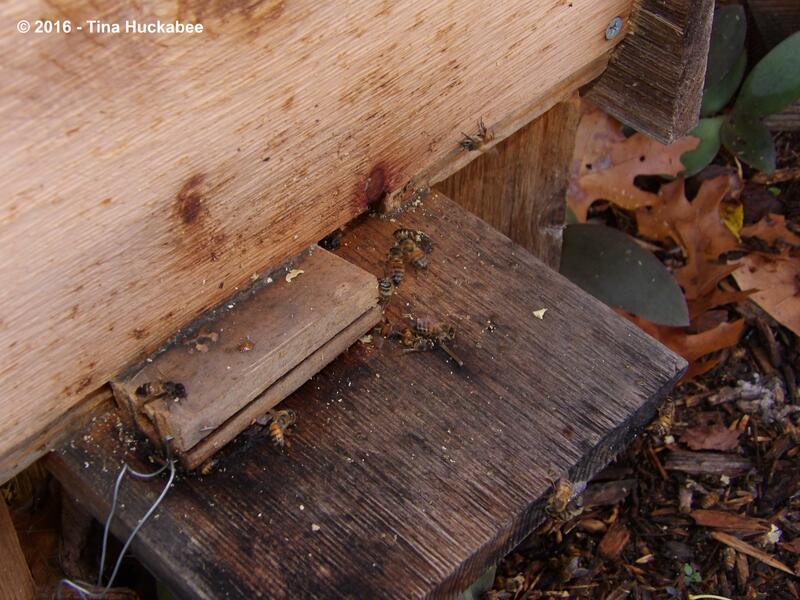 Varroa mites, Varroa destructor, are probably the greatest single threat to honeybees. The mites have a complicated life cycle, but essentially they feed on the blood of adult bees and the brood, causing disease, deformities, and general mayhem in honeybees. I didn’t witness any deformed wings which is a common visual symptom of disease, but Mufasa’s honeys exited the hive in droves and that’s another sign that the bees are infected and dying. Zom-bees. That can’t be good. 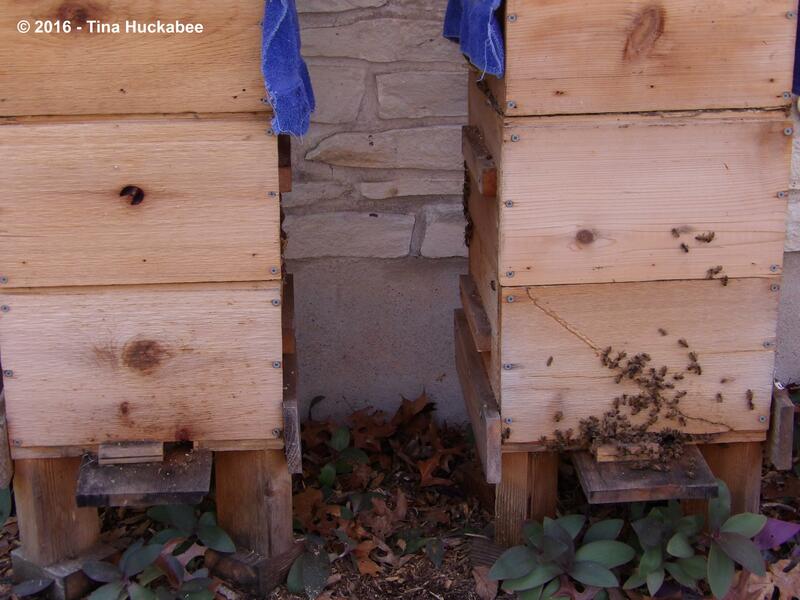 …and were in piles on the ground around the beehives. My bees are BeeWeaver bees, touted as varroa resistant through genetic selection of queens resistant to the varroa mites. Of course varroa resistant doesn’t necessarily mean varroa proof. BeeWeaver claims that fewer than 5% of their queens will succumb to varroa mites and apparently, Mufasa’s queen landed in that statistical range. BeeWeaver bees are the descendants of bees who survived the initial onslaught of varroa mites in the late ’80s. An idea behind their survival is that they’re particularly tidy bees and they rid themselves of varroa when the varroa arrive–and sooner or later, varroa mites will arrive. Varroa mites are the biggest invasive scourge that North American honeybees and their keepers must deal with. 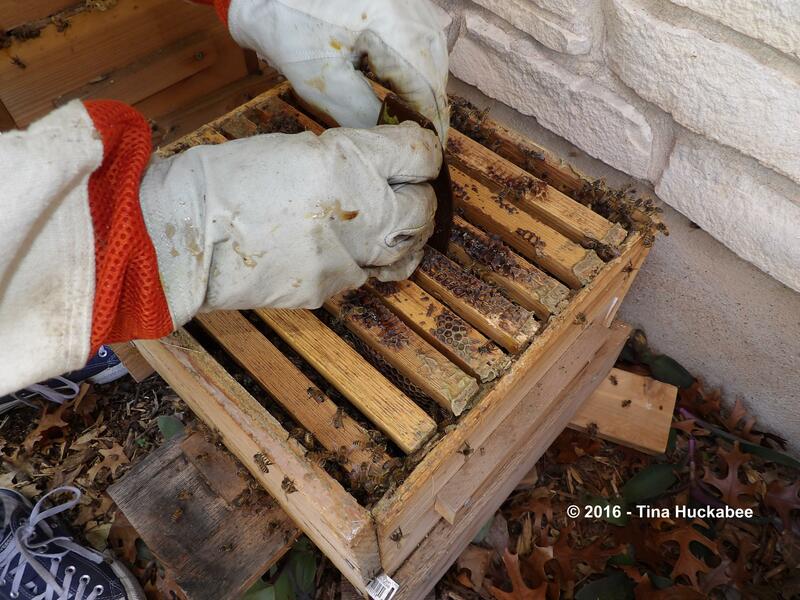 Bee Daddy and I have been fortunate–this is the first hive we’ve lost in the almost two years since we began this buzzy backyard adventure. 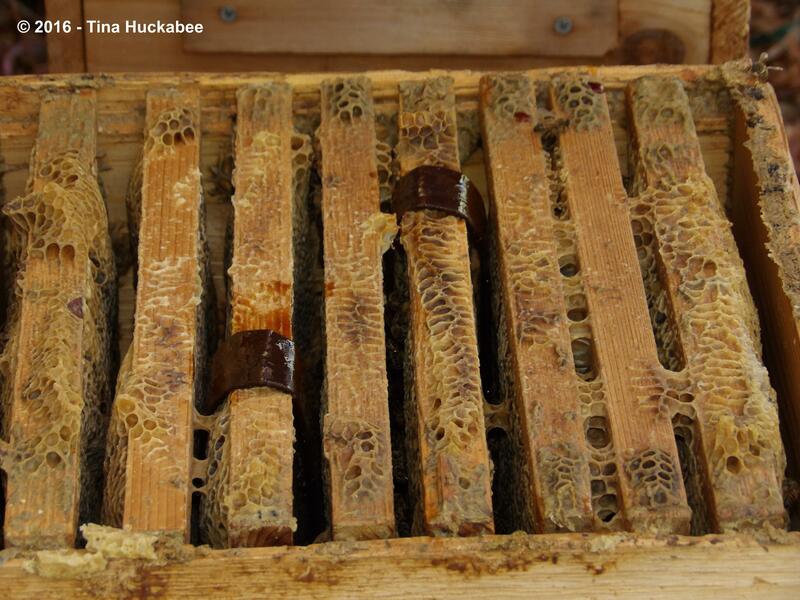 In fact, in early summer of 2014 shortly after we started beekeeping, we removed a couple of frames of comb from one of our new hives and on some of the larvae I saw several varroa mites; I just knew that the hive was a goner right then and there. But true to their varroa resistant genetics, the bees rid the hive of the mites and the hive continued successfully, despite occasional (some might say, constant) beekeeper ineptitude. I think my mistake was in assuming that my bees were immune to an infestation, rather than keeping a keen watch on the goings-on of the hive, year-round, winter included. I became a complacent bee keeper. We treated Mufasa with an organic product called HopGuard II, which is made from hops. Apparently, beer helps all situations. 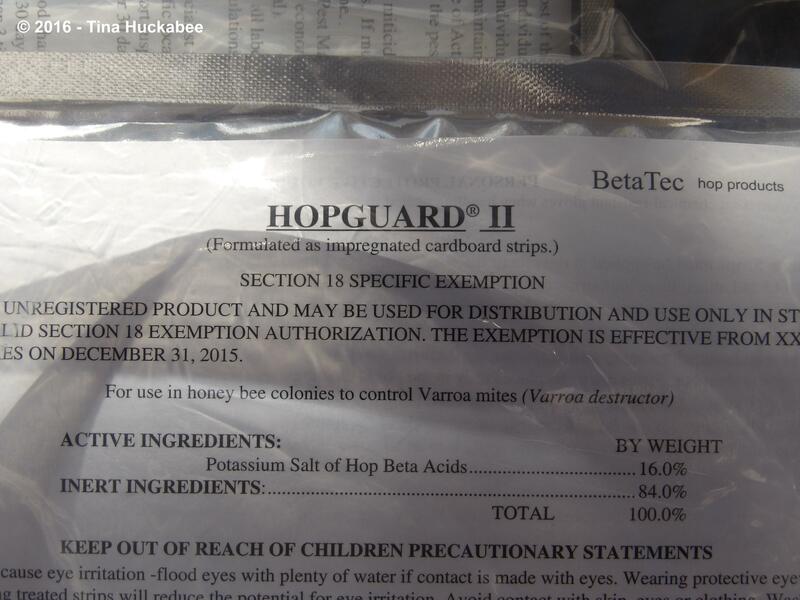 HopGuard comes in a sealed package and contains a series of strips coated with a thick and sticky hops solution. 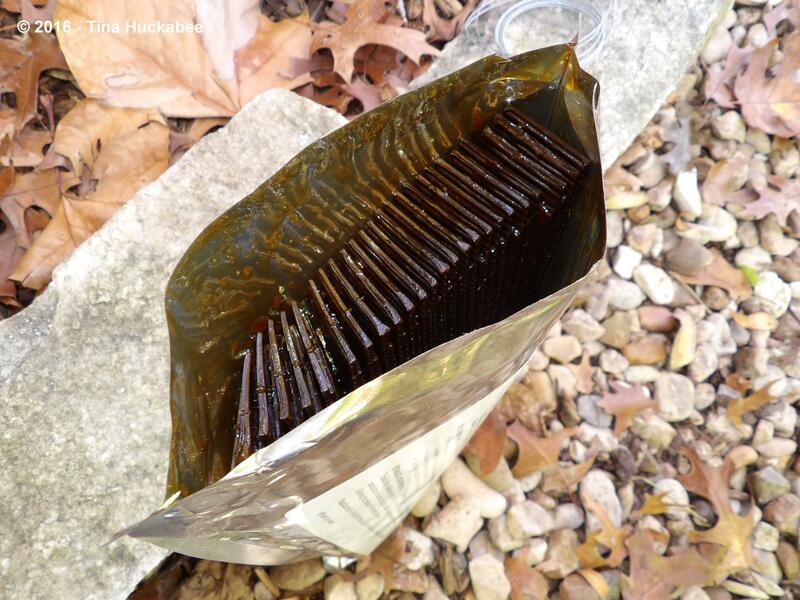 We placed two gooey hops strips in each box of each beehive, each draped over a comb. Though not showing any symptoms of infestation, we treated Scar because as Mufasa was dying, she was also robbed of her stores of honey (yes, honeybees do that) and it’s possible the mites could migrate from Mufasa to Scar if we don’t stay ahead of the mite situation. …there are lots of bees buzzing around Mufasa (left in the photo), but this was taken after many (most?) of Mufasa’s bees absconded and died. I’m guessing that the bees are Scar’s bees, or even bees from another nearby hive, robbing poor Mufasa with abandon. The HopGuard procedure was simple enough, though it’s messy. I could smell the grainy fragrance for a day or so afterwards. For the moment, Scar appears healthy and we’ll treat with HopGuard II again when temperatures are appropriate. I’m sad about Mufasa’s death, but life is full of loss and one must learn from experience and move forward. If we’re going to lose a hive, now is not a bad time. Bee Daddy is busy making two new Langstroth hives and we’ll have two new honeybee packages (mated queens each with 10,000 workers) delivered in April. With our plans in place to hive new honeybees in more easily managed and efficient hives, we were going to let Scar and Mufasa just…bee, allowing them to swarm (if they want) or to just hang out to pollinate and nectar as they see fit. For Scar and Mufasa we would become honeybee havers (thanks Debra, at Under the Pecan Trees for that one), rather than honeybee keepers. There is a bit of activity in Mufasa even now, though very little; the difference between Mufasa (left) and Scar (right) is telling. 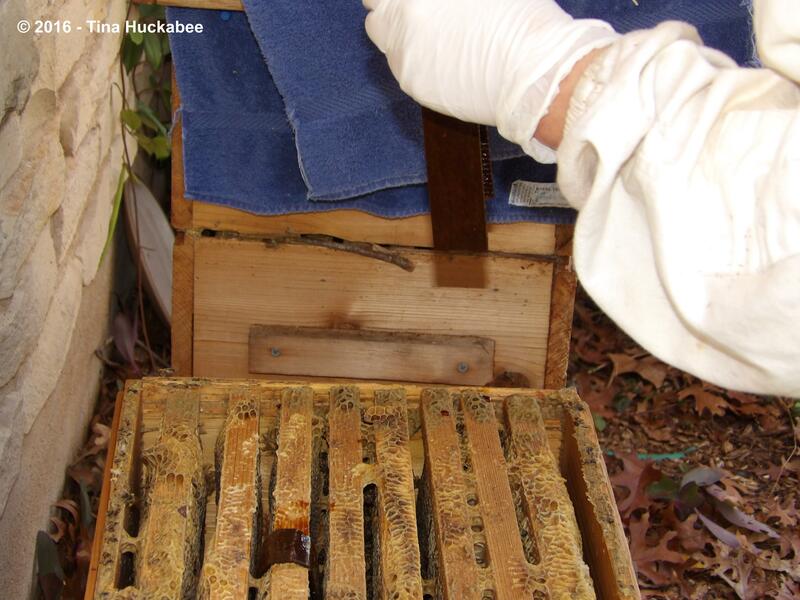 As of this post, I haven’t opened the hive up fully since treating with the HopGuard, but I did peek in about 10 days after treating and things were very quiet, certainly in the top two boxes–I can’t see into the bottom box. There was no buzzing and no concerned guard bee coming to the top to check me out, bum in the air ready to warn the rest of the hive of an invader, so I’m guessing there’s little life left. If this winter continues mild, it’s possible that there might be a bit of Mufasa by springtime, but I’m not hopeful about that. We’ll just have to wait, be patient, and accept the outcome. In the days that followed the revelation that we were losing Mufasa, I was out dealing with leaves in the garden. I spied a probable drowned honeybee in one of my birdbaths. I hate to see their floating bodies, so I always fish them out and deposit them in a garden; a garden seems like an appropriate resting place for a dead bee. This little girl vaguely waved a leg at me, so I cradled her in my palm in the hopes that my warm skin might revive her, all the while depositing rakes and other garden utensils in their appropriate places with my other hand. Within about 5 minutes, she’d revived, was licking off the offending bird bath water and then, without so much as a by-your-leave, she flew off to her next pollinating date. The resilience of that little bee was affirming in the wake of Mufasa’s death. Her drive to live and continue her community responsibilities and her acceptance of life in that moment, was touching and a good reminder of the importance of purpose. It’s been a transformative adventure to learn about honeybees–to work in the garden closely with them and to learn about their remarkable lives. Becoming a backyard bee keeper has also strengthened my commitment to providing for native bees and all the other pollinators so important to the health of our ecosystem. I’ve loved and planted native plants, focusing on gardening for wildlife in my personal garden and beyond. By actively encouraging pollinators to live and breathe in my gardens by what I choose to plant–or not–I hope to continue an intentional repair of the world, in my own small space, giving respite and nourishment to wildlife despite occasional losses and setbacks. Lastly, Bee Weaver shared a lovely and locally produced film by Dylan Tidmore profiling two Austin beekeepers, Tanya Phillips and Chuck Rayburn–and of course, the real stars of the production: honeybees. 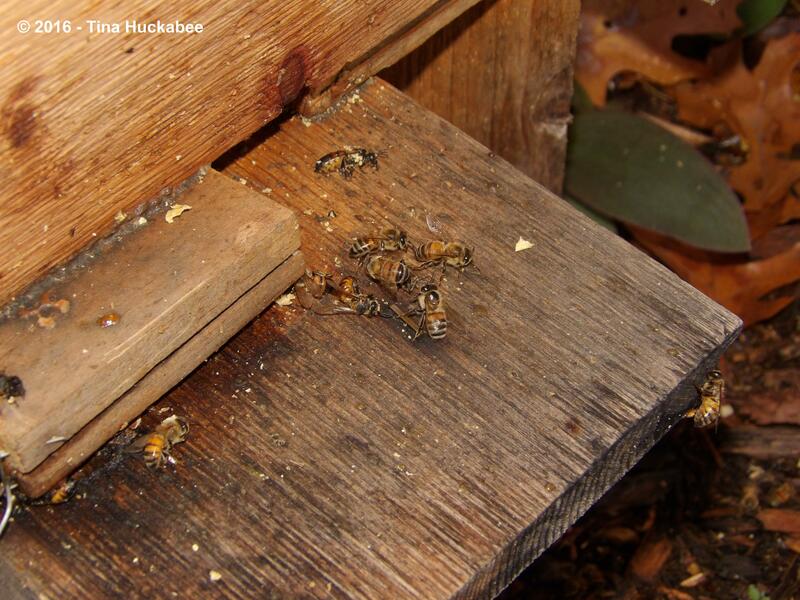 This entry was posted in Beekeeping, Honeybees, Uncategorized and tagged Varroa destructor, Varroa Mites by Tina. Bookmark the permalink. So sorry to hear about your Mufasa hive:( It is so encouraging to hear how you are helping the bee population. I love seeing bees around my yard and plant “bee” specific plants for them. They are currently all over my Lavender and African Basil plant. Thank you for sharing the beautiful video. Ah, thanks! I know that many gardeners, most in fact, plant with pollinators and other wildlife in mind–so good for you! Honeybees love lavender and many herb flowers–I’m sure yours a very busy bees. We are fascinated by bees. They are amazing and your article was fantastic! This is a post the girls posted. Bees are worthy of much fascination. 🙂 I liked your post–great photos and information. I’m glad you liked the video–I thought it was well done. So sorry to hear about your infested hive but what a fascinating post. I have never heard about the use of an organic hop- based varroa protection. Good luck with your new hives. Thanks, Chloris–I hope the new hives will be full of happy and pollinating bees. Beer will save us all! Well, maybe not…. We’ll see how things progress with the hive. I think I’ll be getting in the hive for another treatment this weekend, as the weather is very mild. Thanks so much for that post – so informative, but awfully sad at the same time. Thanks, Cathy. It’s been sad, but it’s also a part of beekeeping, unfortunately. It’s what’s put me off. I would so much like to ‘keep’ bees myself. Friends’ experiences in the UK have been as sad as yours recently. But I really liked the upbeat of hope at the end of your post. Sad to hear about Mufasa but resilience isn’t limited only to your bees. Your patience and acceptance of the ways these processes play out is just as inspiring. I used to feel a little silly for rescuing bees from the swimming pool and bird feeders but no more. Rescue away, my friend!! Just don’t let the neighbors see! Isn’t that video just the sweetest thing? 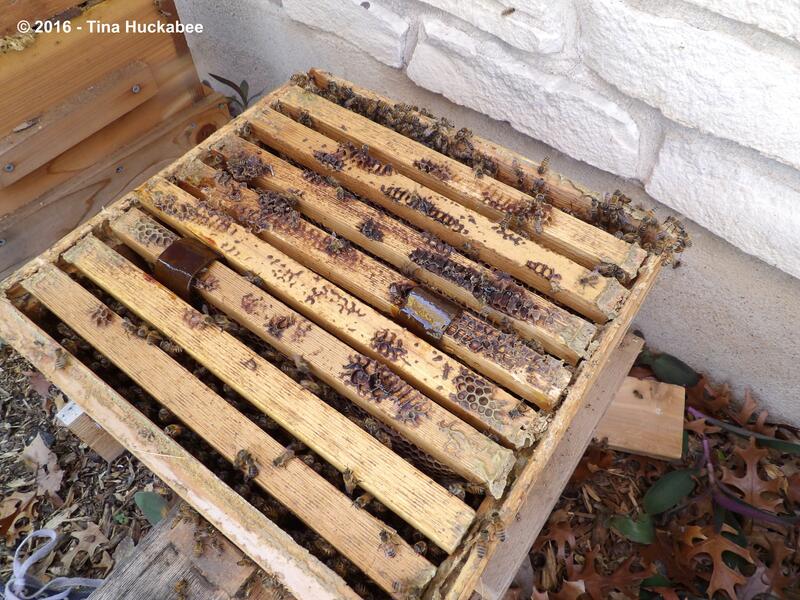 It’s quite remarkable to see a hive with varying stages of larvae, or “squishies”, as one of the Austin Area Beekeepers Associations leaders calls the larvae. You can see why. Poor critters of all shapes and stripes, having to adjust and (maybe) survive all the junk we’ve thrown their way. It’s disheartening, but when I witness their drive to survive, I’m buoyed. So sorry to hear about your hive. I found some hive beetles in mine this year, but haven’t seen any mites. I’ll keep an eye out. I am very sorry to read you have lost one of your hives Tina, I can imagine how sad this is for you and your husband. I hope that there will be some signs of life from Mufusa in the Spring. I was touched by your thoughtful words regarding your reason to garden and care for wildlife as you do. Thank you, Julie. I’m sad, but also philosophical. 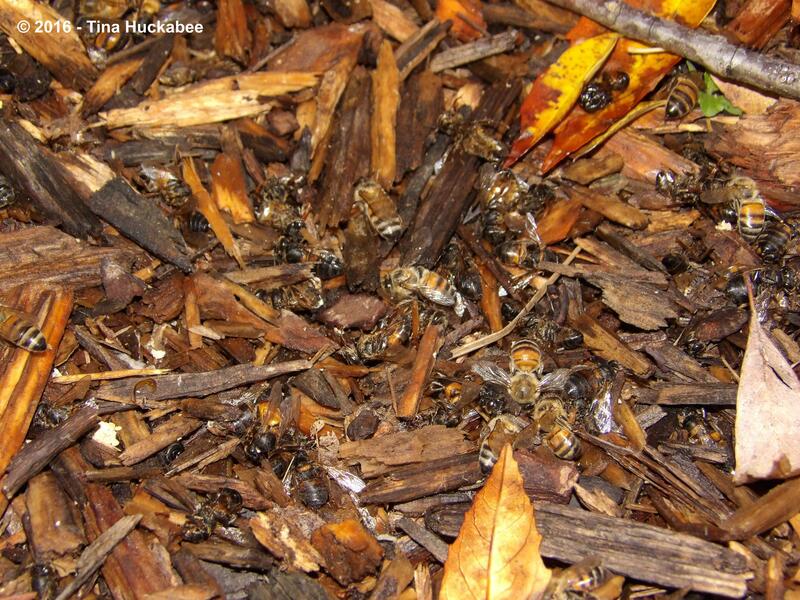 Hive loss is part of beekeeping and death happens–to plants, critters, and people–it’s just the way it is. We’ve enjoyed hosting these wonderful insects and will continue to do so. Thank you, Frances. 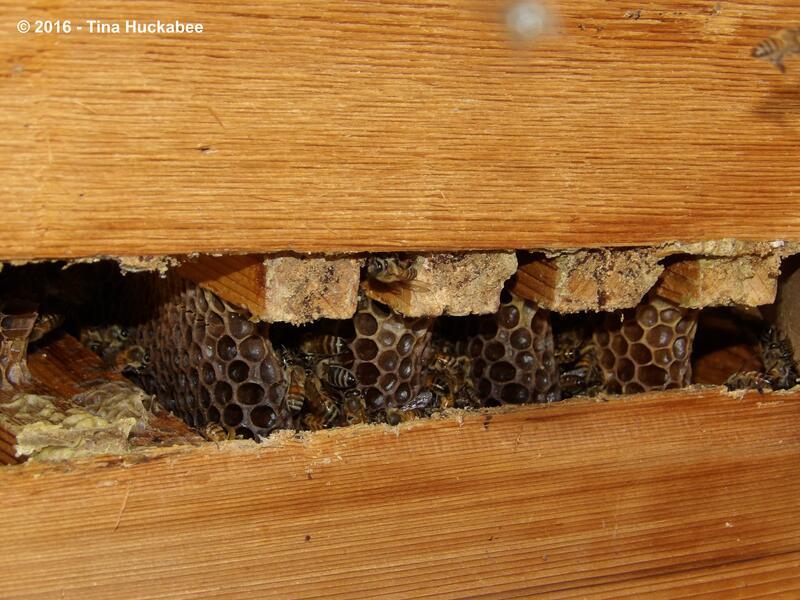 Poor honeybees, there are so many obstacles to their well-being. I hope the other hive will continue healthy, too. It makes me think of the wildlife rescues I have done and lost…You try. learn from that and move on…. I am so sorry to hear about the varroa mite problem. Hopefully you’ve protected you Scar hive in time and what a universal cure-all beer is! Fingers-crossed for Mufasa still. Thanks–and I think Scar is doing well. There are still a few bees going in and out of Mufasa, so there’s some chance that they’ll survive winter. What happens after that, I’m not sure, but I’ll just take it one hive check at a time and the bees will probably get another dose of beer this weekend. How sorry I am to read about the trouble with your hive. This is such a sad post, yet so interesting and ultimately, inspiring. The penultimate paragraph – with your commitment to our wilder friends – is so heartening, particularly the final sentence of that paragraph. Thank you, Sarah. It is sad–I do feel like I let Mufasa and her bees down, but I’ve learned a good lesson and will keep a better eye out in the future–and not take anything for granted. Hive loss is really a part of beekeeping and I’m pleased that we’ve done so well, so far. My condolences on the loss of Mustafa. I hope Scar stays healthy! I have seen the population of wild bees around here drop dramatically, then rebound somewhat. Thanks, Jason. There are always wild bees, but you’re correct that they’re having all sorts of issues too. Plus, no honey for us. 🙂 Like you, I used to not see many wild bees and now there seem to be more and that’s a good thing. I learn so much from your posts about your bees. Thanks! 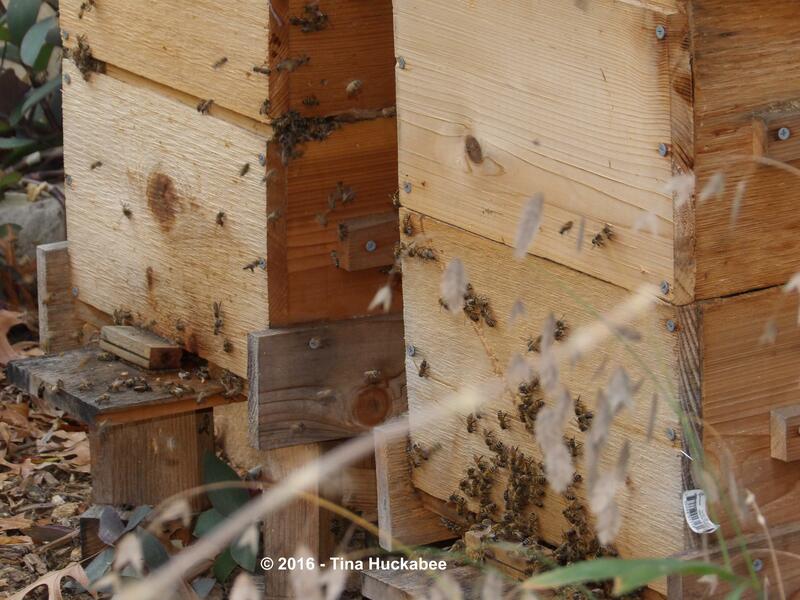 It must have been disheartening to see the bees leaving the hive in droves–so sorry. Darn Varoa Mites. Yes, beer (& hops) helps with so many things. My daughter gave me a liquid handsoap as a holiday gift that’s made from beer and honey. It’s quite refreshing! Thought you might be interested. Here’s the link: http://www.cacklebee.com/#!foaming-liquid-soap/c1vmv. I’m glad you enjoy the posts, Beth. I’ve certainly learned so much from the honeys and what I’ve learned as expanded other interests, as well. Darn Varroa–I agree!! What a scourge! How nice that soap must be. I love locally made products like that–so special. I want to add bees to my garden at some point so I really appreciated your information and photos; there is so much to learn. I hope you do add some nice honeybees and also, plant and leave out wood for native bees, too. You won’t be sorry! The learning curve is high and there are disappointments, but I can’t imagine ever having a garden without honeybees–it just wouldn’t be a garden to me. Actually, there’s some interesting work going on in your lovely state on varroa mite control–something to do with mushroom growth. I felt really sad to see those bees lying close to the Mustafa hive Tina. I imagine how it was for you to see them, although as gardeners we are used with all sorts of loses, but still…Maybe there is a chance that will get back to life and I surely hope that the other one is not affected. This sort of happenings put things into perspective. Yeah, it was a sad, sad thing to see. You’re right though, those of us more connected to nature and the outdoors, see loss and the difficulties of the natural world a bit differently than others. So far, so good with Scar. Fingers crossed! Oh gosh. I am so sorry to hear of Mufasa’s passing. I think my heart would be torn in two to find all those little bodies and to imagine their suffering. I also sincerely hope you are not blaming yourself. You did the things you could do — chose a good variety, gave them a clean and healthy space and even interceded when it looked like illness struck. I would call this a stroke of tragic bad luck. I had a similar bee rescue story from today. As I was waking up I thought I heard bee buzz and sure enough there -was- a bee on the window trying desperately to get through the glass. How did she get inside?!?! I hope if she is a scout that she will tell everyone what a BAD idea coming inside was. I caught her and took her outside and I imagine I felt like you did — that every little bit of life is precious. The film was mesmerizing in image, sound and content. Thanks so much for sharing it!